By analysing the data of the intensive care unit (ICU) component of the German national nosocomial infection surveillance system (KISS) during the last ten years, we have observed a steady increase in the MRSA rates (proportions) from 2001 to 2005 and only a slight decrease from 2006 to 2010. The objective of this study was to investigate the development of the incidence density of nosocomial MRSA infections because this is the crucial outcome for patients. Data from 103 ICUs with ongoing participation during the observation period were included. The pooled incidence density of nosocomial MRSA infections decreased significantly from 0.37 per 1000 patient days in 2001 to 0.15 per 1000 patient days in 2010 (RR = 0.40; CI95 0.29-0.55). This decrease was proportional to the significant decrease of all HCAI during the same time period (RR = 0.61; CI95 0.58-0.65). The results underline the need to concentrate infection control activities on measures to control HCAI in general rather than focusing too much on specific MRSA prevention measures. MRSA rates (proportions) are not a very useful indicator of the situation. Methicillin resistant S. aureus (MRSA) is the major focus of public awareness of healthcare-associated infection (HCAI) problems in many countries and surveillance should support the work toward decreasing nosocomial MRSA infections. However, by analysing the data of the intensive care unit (ICU) component of the German national nosocomial infection surveillance system (KISS), we have observed a steady increase in the MRSA rate as a percentage of nosocomial MRSA infections among all nosocomial S. aureus infections from 2001 to 2005 and only a slight decrease in the period from 2006 to 2010. The objective of this study was to investigate the development of the incidence density of nosocomial MRSA infections during the observation period, because this is the crucial outcome for patients. The ICU surveillance method used in KISS is almost identical to the method used by the National Healthcare Surveillance Network (NHSN) for surveillance of HCAI in ICUs , . Participation in KISS is voluntary and results are handled confidentially. HCAI are mainly registered by infection control practitioners but also by physicians. They are trained in KISS methodology and in applying CDC definitions for HCAI. The number of participating ICUs has increased from year to year. Up to 2004, the ICUs received their data twice a year to provide feedback and encourage infection control activities; since 2005 they have had the opportunity to analyse their data whenever they want, due to the introduction of a web-based data management system. In the case of an HCAI, up to four pathogens probably responsible for the infection can be recorded. As well as their HCAI rates, the ICUs also receive a list with their case patients and the pathogens probably responsible. The ICU KISS data from January 2001 to December 2010 that were used for this analysis focused on microbiologically-confirmed primary bloodstream infections, X-ray-confirmed nosocomial pneumonia and nosocomial urinary tract infections accordingly because the definitions for these infection types did not change during the observation period in KISS. Only those ICUs that provided data for at least 3 months per year during the entire study period were included. The MRSA rate (proportion of nosocomial MRSA/nosocomial S. aureus infections) and the incidence densities of nosocomial Methicillin susceptible S. aureus (MSSA) infections and nosocomial MRSA infections (both per 1000 patient days) were calculated. Relative risks (RR) with 95% confidence intervals were determined to compare the yearly pooled means of nosocomial MRSA infection incidence densities. In addition, the development of all HCAI in general was described by calculating RR and 95% confidence intervals to compare the yearly pooled means of all HCAI incidence densities. Data from 103 ICUs, about 1 million patients with about 3.5 million patient days and a total of 20,504 HCAI were included. Among the HCAI were 2,026 nosocomial MSSA infections and 921 nosocomial MRSA infections (Table 1 and 2). The pooled mean MRSA rate (nosocomial MRSA infections/nosocomial S. aureus infections) increased from 2001 to 2005 and decreased slightly until 2010 compared to the starting point. However, the pooled incidence density of nosocomial MRSA infections decreased significantly from 0.37 per 1000 patient days in 2001 to 0.15 per 1000 patient days in 2010 (RR = 0.40; CI95 0.29-0.55) (Figure 1). This decrease was proportional to the significant decrease of all HCAI during the same time period (RR = 0.61; CI95 0.58-0.65) (Figure 1). Characteristics of 103 ICUs with continuous participation in ICU-KISS from 2001 to 2010. ICU, intensive care unit; No., number; IQR, interquartile range. Incidence densities of nosocomial infections with MRSA and MSSA and all nosocomial infections. NI, nosocomial infections; MSSA, Methicillin sensitive S. aureus; MRSA, Methicillin resistant S.aureus, focused on microbiologically-confirmed primary bloodstream infections, X-ray-confirmed nosocomial pneumonia and nosocomial urinary tract infections. 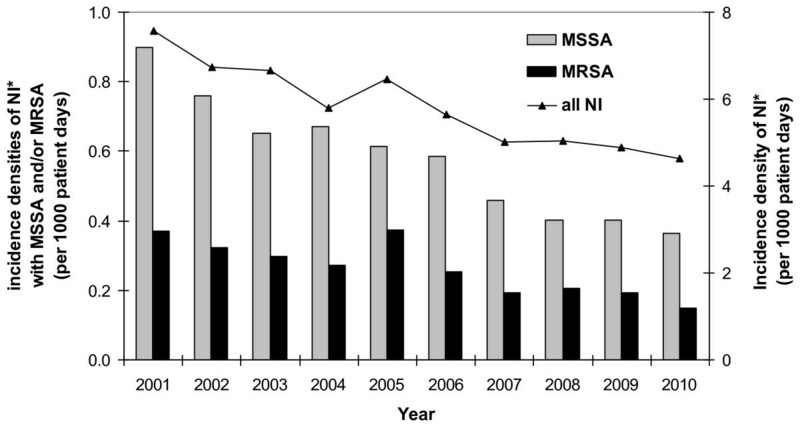 However, despite a general trend of relative unchanged proportion of MRSA among nosocomial S.aureus infection during the last 10 years, the participating ICUs were able to significantly decrease the incidence of nosocomial MRSA and MSSA infections by the same proportion (60%) through surveillance of nosocomial infections, feedback and appropriate intervention measures, whereas the overall HCAI incidence was decreased only by 39%. This development in KISS ICUs is in accordance with the development of the incidence of nosocomial MRSA infections in other countries. For example, US intensive care units observed a 49.6% decrease in the MRSA central line associated bloodstream infection (BSI) incidence in the period from 1997 to 2007  and French intensive care units in the Paris area achieved a 59% decrease inf the MRSA burden from 1993 to 2007 .However, it is necessary to interpret the data carefully, because there are indeed some limitations. Firstly, the sensitivity of diagnosing HCAI may have changed during the study period. A decreasing rate of microbiology reports would lead to a decreasing incidence density of nosocomial MRSA infections. However, the annual proportion of HCAI with microbiology reports was 90.8% in 2001 and 89.4% in 2010. Secondly, the severity of illness of ICU patients may have changed. If ventilator utilization rates are taken as a surrogate parameter, this is not the case, as these rates were 42.3% in 2001 and 42.7% in 2010. Thirdly, CDC definitions for BSI and pneumonia changed during the observation period. However, by focusing on microbiologically-confirmed BSI and X-ray confirmed pneumonia only, instead of including all BSI and pneumonia cases, this should not have had an influence. This significant decrease of HCAI MRSA infections was masked in Germany because the public only looked at the MRSA rate and did not recognize the significant decrease in the incidence of MRSA infections, at least in the group of KISS ICUs. The concentration on the proportion of MRSA and other multidrug resistant pathogen instead of surveying the incidence of MDR pathogens may lead to less awareness of the need for the prevention of HCAI in general. Other nosocomial pathogens may lead to similar or even higher attributable morbidity and mortality. Our results therefore underline the importance of concentrating on measures to control HCAI in general, rather than focusing too much on specific MRSA prevention measures. We thank all physicians and nurses in the participating hospitals who provided their infection data to KISS. We also thank the German Ministry for Health for granting this project. PG and CG are responsible for the concept, design and implementation of the ICU-KISS surveillance module. MB supervised the web-based platform for the surveillance module and managed the data collection. FS performed the statistical analysis and interpreted the data. PG drafted the manuscript. CG, MB and FS critically revised the manuscript. All authors read and approved the final manuscript.